Nautically themed cakes are popular choices for Maine coastal weddings. Maine is filled with local legends, tall tales and offbeat stories. In Kennebunk, on Port Road (Route 35) there is a famous historic home that is officially known as The Wedding Cake House. It looks like a European cathedral and is adorned with five buttresses with adjoining pinnacles. Tiered, sumptuous and ornate, the house definitely looks edible. The Wedding Cake House is the most photographed house in Maine. However, it is the colorful story associated with the home that is even more impressive than its Carpenter Gothic architecture. Local legend claims that a guilty sea captain who needed to return to sea before he could take his bride on a honeymoon constructed The Wedding Cake House. Another story ups the ante and suggests that the captain needed to return to sea before the newlyweds even had a chance to eat their wedding cake. What is the point of this tale? If you are planning a destination wedding in Maine, make sure you find a pastry chef or a specialty baker that can create a cake as beautiful as The Wedding Cake House. Yes, ladies, wedding planning is stressful, but it does not have to be a hassle. The blueprint style planning that goes into throwing a large or intimate wedding can be headache inducing and exhaustive. You need to relax and take a deep breath. You need to hold your Yoga-centric cool. How do you do this? It’s simple: You need to go on a taste testing date with your future husband. Why not sample all the wedding cakes before you settle on one. Custom Maine wedding cakes can be classic and traditional or as offbeat and whimsical as The Wedding Cake House in Kennebunk. Traditional flavors include the always-popular Almond white, Vanilla white, marble, red velvet and deep chocolate. However, chances are if you are having a destination wedding on the coast of Maine, then you probably want a wedding cake that has a New England theme. How about a three tiered cake decorated with fondant seashells and sand dollars? You could opt for a torte topped with royal icing and sugar lobsters, or a piped buttercream with fondant starfish and nautical netting. 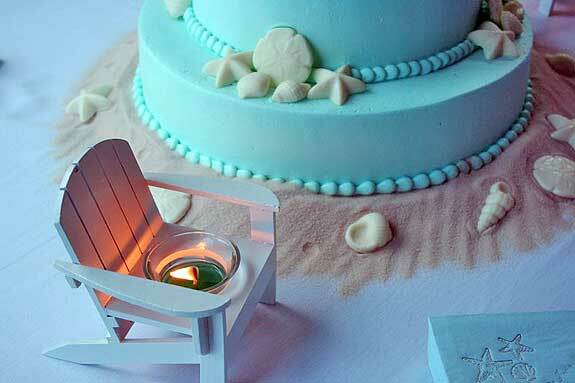 Wedding cakes decorated with sea glass, deck chairs and elegant roping are also a possibility. When it comes to customizing a wedding cake, there are endless possibilities. Most specialty shops and high-end bakeries will have a catalog proudly highlighting their best work. Ok, ladies. So you and your special someone decided on a vanilla white cake layered with Stonewall Kitchen’s Wild Blueberry Jam. What is next? Be sure to order your cake three to six months in advance. There is no set price for wedding cakes. It varies considerably depending on size, style and the types of ingredients that are used. From traditional wedding cakes to outrageous marzipan sculptures, Maine has an array of skilled and creative bakeries that will closely work with you to ensure your cake is the masterpiece you have always dreamed of. Most of these places require an appointment. Let Them Eat Cake, a high-end specialty shop in Kennebunk, caters to Wells, York, Ogunquit, Portland, Cape Elizabeth, Freeport, Falmouth, Kittery and Berwick. Edible Delights is stationed at Old Orchard Beach. Its head baker has over twenty years experience. The bakery specializes in “rolled fondant” icing. Cakes Extraordinaire, Custom Cakes and Good Eats Boutique can all be found in Portland. There are skilled pastry chefs at Sticky Fingers Cakes in Waldoboro. Sticky Fingers Cakes caters to midcoast Maine. Fields of Cake and other Good Stuff is a quirky and offbeat shop in Brunswick. Monkey Business Bakery, South Berwick. Remember, ladies, if you want to step outside the box and put all the foodies in your reception party into a fit of glorious rapture, then you could always order an elegant (and colossal) display of creatively designed cupcakes. Better yet: The Whoopie Pie is the official state treat of Maine. There are numerous cutting-edge pastry chefs that would be happy to design gourmet Whoopie Pies for your special day. It’s food for thought.